Monday, June 23, 2014 � 2:00 p.m.
Click here to view the meeting with RealPlayer. The TDLR Commission has appointed James Bowens of Round Rock, and Michelle Narlo of Austin to the Barber Advisory Board. They will replace Jimmy Johnson and Michael Funk. Monday, April 28, 2014 � 2:00 p.m. Proposed barber rule changes will be on the meeting agenda. February 24, 2014 2:00 p.m.
Click here to view video archive of the meeting with RealPlayer. The study is in the Adobe Acrobat format. You will need the Adobe Acrobat Reader to view it. TDLR Proposes Legislative Ideas -- Are These Ideas Good or Bad for Barbers? You will need the Adobe Acrobat Reader (Free Download) to read the file. Go to http://get.adobe.com/reader/otherversions/ and follow the instructions. Monday December 13, 2010 at 9:30 a.m. The number of barbers licensed through barber schools dropped dramatically after TDLR took over regulation of the barber industry in 2005. The average number of new barbers licensed per year in the last five years was about 485, including barbers who came in from out of state. Compare that to the 917 barbers licensed in 2004 and 820 barbers licensed in 2005. Only 1904 students passed the practical exam from Sep. 1, 2005 - Dec 1, 2010, or about 380 per year. All barber school owners, school teachers/instructors, barbers and students are encouraged to attend. We must find and fix this problem if our industry is to survive. The meeting time is now not limited. There are a lot of other important issues that need to be discussed. Link to Spreadsheet Showing Drop in Barbers The numbers in the spreadsheet are derived from data on the TDLR website and data acquired through public information requests. Link to Spreadsheet Showing Estimated Loss of Barbers Under TDLR The numbers in the spreadsheet are derived from data on the TDLR website and data acquired through public information requests. Spreadsheet Showing Summary of Written and Practical Pass & Fail for current barber schools; Sep. 1, 2005 - Dec 1, 2010. The spreadsheet was derived from data compiled from data found at the "Search Scheduled Exams and Exam Results" link on the TDLR Barbering page. The Texas Department of Licensing and Regulation has filed a notice of intent to review and consider for re-adoption, revision, or repeal, Title 16, Texas Administrative Code, Chapter 82, Barbers. This review is being conducted in accordance with the requirements of Texas Government Code, �2001.039. The Notice of Intent was published in the November 12, 2010, issue of the Texas Register (35 TexReg 10064). View the Notice of Intent and the current Chapter 82, Barbers rules on the TDLR website. Any questions or written comments pertaining to this rule review may be submitted by mail to Caroline Jackson, Legal Assistant Team Lead, General Counsel�s Office, Texas Department of Licensing and Regulation, P.O. Box 12157, Austin, Texas 78711, or by facsimile to 512/475-3032, or electronically to rule.comments@license.state.tx.us. The deadline for receiving comments regarding the rules and possible changes is January 13, 2011. Please forward a copy of the comments you send to TDLR to webmaster@texasbarber.com. There were four Barber Advisory Board work groups that were supposed to look at four areas of the barber rules and report at the October meeting. 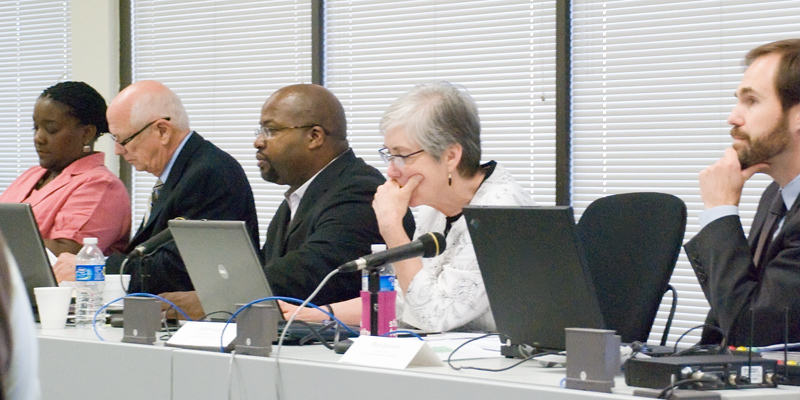 The Education curriculum work group, (Ron Brown and Jennifer Grisham) was the only work group to file a written report. View Education Curriculum Work Group Report. Newsletter We are forced to pay $10 per renewal for a newsletter. TDLR has not been giving us timely or relevant information with the newsletter. Why should we have to pay for it? Either make it useful, or get rid of it. Cosmetologists don't have to pay for a newsletter, why should we? Rule 82.71(c) The shop owner and/or shop manager shall maintain a current list of all individuals who work in a shop at the time of inspection including employees and independent contractors who engage in barbering. Link to Rule 82.71 This rule does nothing to protect the public, improve the barber industry, or serve any other useful purpose. It is a Class B violation, which had a fine of $100 - $1000 on the first offense. Instead, require that inspectors match each license with the barber's photo ID. The inspection form should also have the information about each licensee inspected on the shop inspection form like it used to. Abolish the Booth Rental Permit, or make it optional. Require that a barber shop be under the control of a licensed barber at all times. Cosmetology has that requirement. Require barber require a high school diploma or equivalent to enroll in barber school. Cosmetology has this requirement. We have big problem with barber students who can't pass the written test. Maybe this would help. "Holder of a Class A barber license who does not hold a barbershop permit". The enhanced agenda was prepared by texasbarber.com and includes the time on the video archive for each agenda item, list of people who spoke, pictures, and handouts that were distributed at the meeting in addition to webmaster comments. The enhanced agenda was prepared by texasbarber.com and includes the time on the video archive for each agenda item, list of people who spoke, pictures, and handouts that were distributed at the meeting. 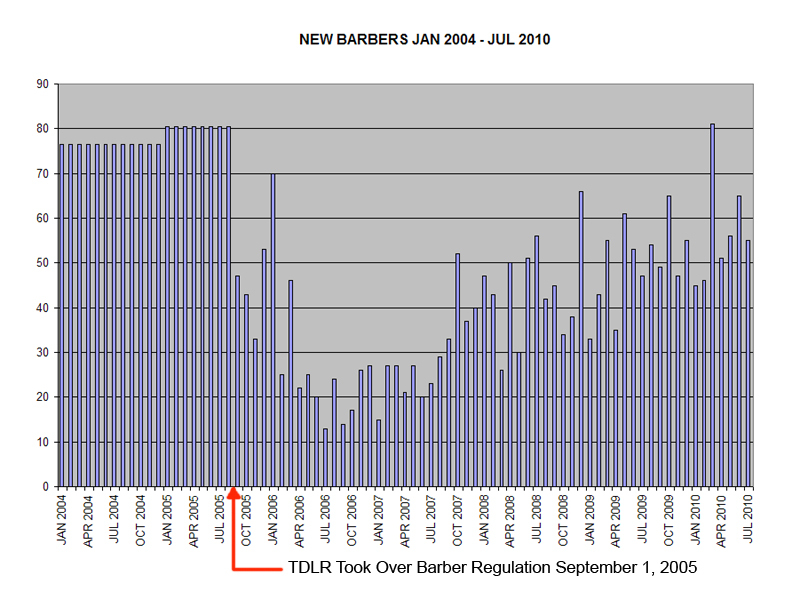 The sharp drop in the number of new barbers being licensed since TDLR took over is one of the most critical issues facing the barber industry. The barber industry cannot survive if there aren't a sufficient number of new barbers entering the system. Below is a chart that dramatically shows the problem. This issue was brought to the attention of the Barber Advisory Board and the TDLR staff in a Barber Advisory Board meeting on July 30, 2007. Since then, the TDLR staff has done nothing. They haven't written a letter to the schools, PSI, the contract testing company, or done anything else to identify the problem or find a solution, except some discussion at a couple of board meetings. They have been asked numerous times by members of the industry to do something, but have not. At the January 12, 2009 Barber Advisory Board meeting, board chair Linda Connor appointed herself and board member Jimmy Johnson to a task force / work group to look into the reason for the drop in the number of barbers with the intention of finding solutions. There wasn't another Barber Advisory Board meeting until April 26, 2010, 15 months later. 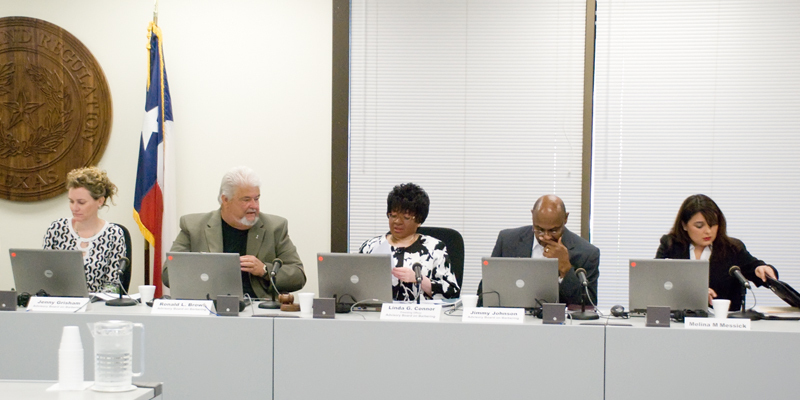 At the April 26th meeting, board chair Conner talked about attempts to get barbering taught in high schools or junior colleges. Nothing was mentioned about why the number of barbers had plummeted right after TDLR took over. Task force report and discussion at the July 12th Barber Advisory Board meeting was limited to presentation by staff and discussion of, "requirements for Barber Schools", "requirements for a Barber teacher(instructor)", "crossover licensing provisions", and "intern/apprenticeship programs". During this portion of the meeting no mention was made of the drop in the number of barbers being licensed through the schools, even though it was brought up at the public comment section by Joe Shirley who asked the Board and TDLR staff to take action. While each of the items discussed may have some merit, they would all require legislative changes to implement. Even if legislation was passed, it would not be implemented until September 1, 2011, a year from now. This is a critical failure on the part of TDLR and the Barber Advisory Board. The June newsletter was sent out about a couple of weeks before the July 12th Barber Advisory Board meeting and contained a nice mention of the upcoming meeting. However, it contained nothing at all about the issues facing the barber industry that would be discussed at the meeting. Licensees are forced to pay $10 per license renewal for the newsletter. The original purpose was to inform barbers about issues important to us. We are not getting what we paid for! 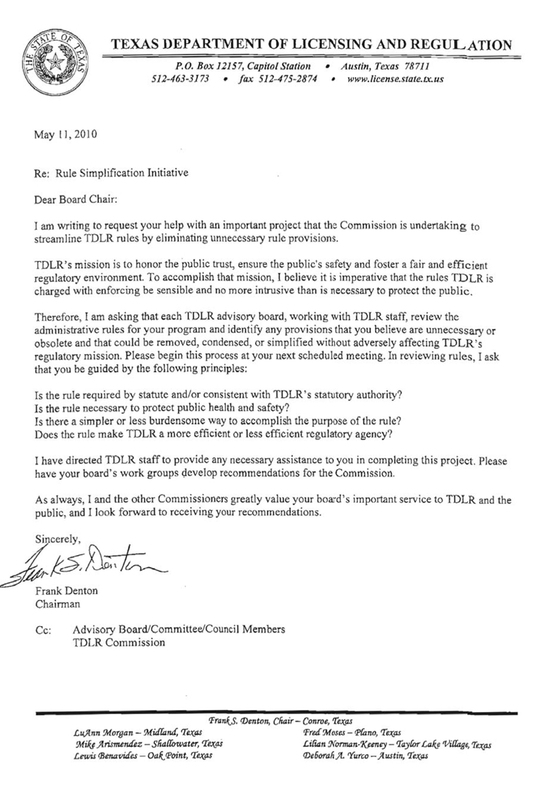 to streamline TDLR rules by eliminating unnecessary rule provisions". Click here to read Chairman Denton's letter. Jennifer Grisham is a Barber Advisory Board member, barber, and owner of the Salon Americana barber shop in Alpine, Texas. She is on the committee to suggest changes to the barber rules. Jennifer intends to visit all the barber schools in Texas and as many of the barber shops as possible to get input on needed rule changes. She was in the Dallas Fort Worth area August 17th. Jennifer is taking time away from her shop and family to get input for needed rule changes to improve the barber industry. She isn't reimbursed for any of her expenses. We need to do our part by reading over the barber rules and sending any suggested changes to her at: jenny@salonamericana.com. The video archive of the meeting is available for viewing with via RealPlayer. Jennifer Grisham, shop owner from Alpine, has been selected to fill one of the two positions on the Barber Advisory Board reserved for Barber shop owners. 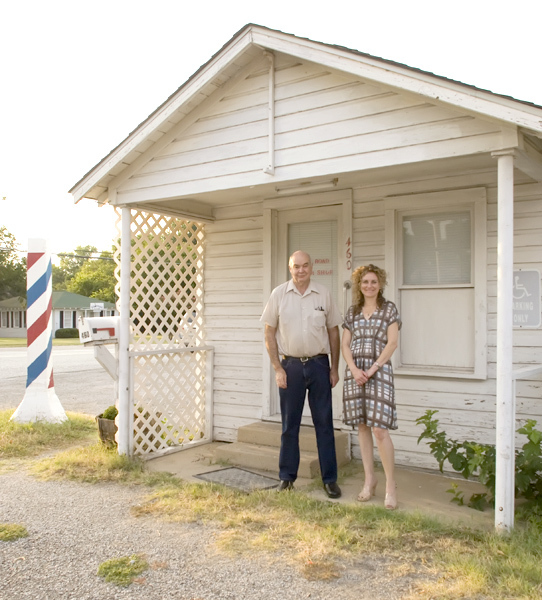 Ms. Grisham will replace Dean Hudson, barber shop owner from Arlington. We look forward to working with Ms. Grisham. Dean Hudson has served on the Barber Advisory Board for many years. We want to thank Dean for his service and look forward to working with him in the future. Ronald Brown, was reappointed to the Barber Advisory Board to represent school owners. 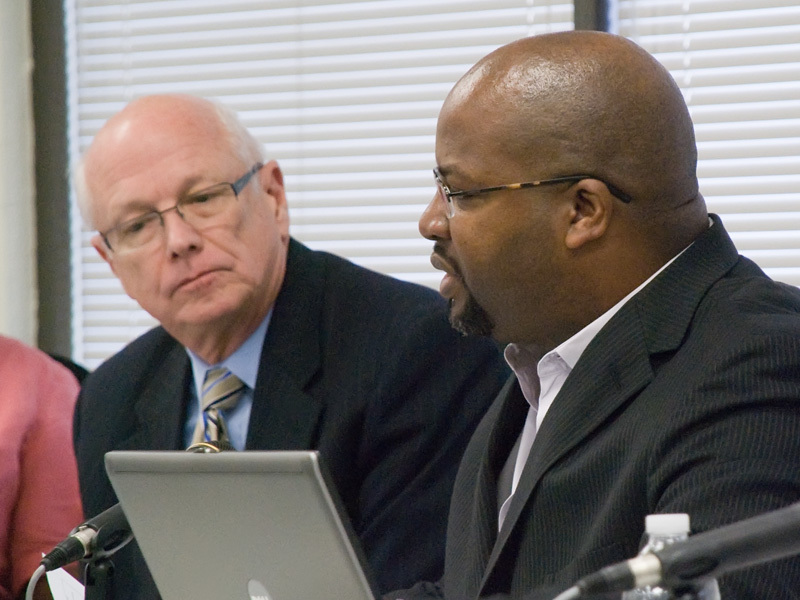 TDLR held a strategic planning meeting on March 22nd for the barber industry. A summary of the comments received at the meeting are in the April Barber Newsletter. If you haven't received your newsletter in the mail, you can read it online. K. Discussion and possible recommendation on the education summit and rule changes relating to curriculum requirements. (Webmaster Comment) TDLR officials met November 17th with a few people to review the barber school curriculum. TDLR staff released the proposed changes to the barber curriculum in an e-mail to the barber list-serve on January 5th. The proposed curriculum files below are based on that e-mail. G. Discussion and possible recommendation on rule changes relating to dual shop advertising and signage requirements. (Webmaster Comment) The current regulations are so lax that a cosmetology salon can advertise as a barber shop, never hire a barber, and probably never get caught. The regulations have to be made stricter so that only legitimate dual shops that have a barber can advertise and operate as a barber shop. Click here for more information. (Webmaster Comment)There is no reason that license and/or permit holders should be forced to buy a law and rule book. Barbers already post the sanitary rules and regulations in each shop. Barbers are already paying for a newsletter. Any important information that we need should be sent to us in the newsletter that we are already paying for. J. Discussion of registration of barber students for the written exam at the completion of 1000 hours. 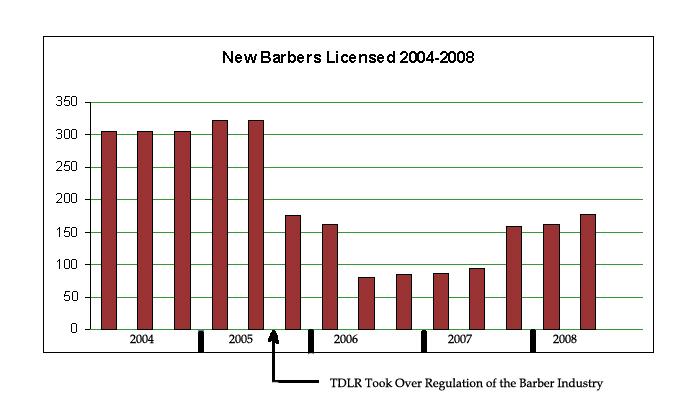 The number of new barbers being licensed per year has plummeted since TDLR took over regulation of the barber industry September 1, 1005. Click here for more information. Some school owners say that after some of their students pass the written test at 1000 hours, they don't come back to school, and thus never get licensed. Barbers have been trying for a year and a half to get TDLR to do address the issue of the drop in the number of barbers being licensed. In the past, students took the written and practical exam after completing the 1500 hour barber course. Consideration of the effect of allowing barber students to take the exam at 1000 hours is the first step that TDLR has taken to address this issue. Two of our Barber Advisory Board members are pushing to allow cosmetologists to shave. One Barber Advisory Board member even appeared before the December 1, 2008 Cosmetology Advisory Board meeting and asked them to push to allow cosmetologists to shave. Shaving is a traditional barber service for which barbers are specially trained. Many barbers do an outline shave on most of their adult customers. Many customers say that the outline shave is their favorite part of the haircut. Why would any barber push to allow cosmetologists, who have no training in shaving, to practice this traditional barber service, that our customers value. The new Dual Shop permit regulations do not protect the identity of barber shops or barbers. Currently anyone can get a dual barber shop beauty salon dual permit, and advertise as a barber shop without having a barber. Theoretically, they are supposed to stop advertising as a barber shop and remove barber pole and barber signs if they haven't had a barber for 90 days. However, there are no reporting requirements. Inspections are now very infrequent, every two, three or four years. If the inspector even asks the dual permit owner where their barber is, it would be very to easy to just say that they recently left and that they would have another one soon. It is very doubtful that the inspector would ever check back. I suspect that they could run this way and never get caught. If this isn't changed it will destroy the identity of the barber shop and probably the barber industry along with it. The sharp drop in the number of new barbers being licensed since TDLR took over is one of the most critical issues facing the barber industry. The barber industry cannot survive if there aren't a sufficient number of new barbers entering the system. Below is a chart that dramatically shows the problem. Each bar represents four months. This issue was brought up at the Barber Advisory Board Meeting on July 30, 2007. Since then, TDLR has done nothing. They haven't written a letter to the schools, PSI, the contract testing company, or done anything else to identify the problem or find a solution, except some discussion at a couple of board meetings. They have been asked a number of times by members of the industry to do something, but have not. This is a critical failure on the part of TDLR, but it was never mentioned in the Strategic Plan that TDLR submitted to the Governor and Legislative Budget Board in June of this year. TDLR bragged about reducing barber license fees from $90 to $70. They even had this posted on the top of the main TDLR webpage for a while. However, they have not put anything on the website about the sharp drop in the number of barbers being licensed since they took over. The Strategic Plan is a very important document that is sent to the Governor, the Legislative Budget Board and others. NOTE! TDLR failed to report the drop in new barbers in Strategic Plan. This is of critical importance to the barber industry and an important measure of what kind of job TDLR is doing. Why was it left out? Audio of October 13th Barber Advisory Board Meeting. Good News! TDLR announced at the meeting that we would soon be getting a newsletter on a regular basis. Susan Stanford, Public Information Officer, will be writing and editing the newsletter. The first test newsletter will be sent out in November. Future newsletters will be sent out each quarter. The newsletter will contain information on new rules and regulations, tips on sterilization and sanitation and other information of importance to the barber industry. Susan would also like to provide some human-interest articles relating to barbers or the barber industry. This should be a great opportunity for us to share information with others in the barber industry. If you have an interesting story about barbers or barber shops, send it in. If you have encountered a problem with any of the rules or regulations, or have a question about anything send that in as well. If you have any suggestions or tips that you think would be of interest to other barbers, Susan would like to have them as well. We have waited a long time for a regular newsletter; let's make the most of it. Still Higher than Cosmetologist License Fee of $53. WHY? Responsibilities of Barbershops, Specialty Shops, and Dual Shops. BARBER ADVISORY BOARD MEETING Monday, October 15, 2007 at 1:00 p.m.
BARBER ADVISORY BOARD MEETING Monday, July 30, 2007 at 1:00 p.m.
Monday, January 8, 2007 at 1:00 p.m.
Monday, December 11, 2006 at 9:00 a.m.
Monday, June 5, 2006 at 9:00 a.m.
February 2, 2006, which will be incorporated in the TDLR Enforcement Plan. The new penalties are large, and increase substantially for second and third violations. Each state agency is required to prepare a Strategic Plan every two years. TDLR is soliciting input from barbers. This is the time to let TDLR know what they are doing well and what needs to be improved. They are now laying the plans for the future. Please attend the meeting or send in your comments. "The Texas Commission of Licensing and Regulation Thursday adopted emergency rules that will allow the Texas Department of Licensing and Regulation (TDLR) to issue provisional occupational licenses and waive licensing fees for evacuees who came to Texas when they were forced from their homes by Hurricane Katrina." Senate Bill 411 Mandated the Change Link to: Senate Bill 411 Text.